Ribble were early adopters of the revolutionary Atlantean chassis and bought 100 service buses in 1959-60. 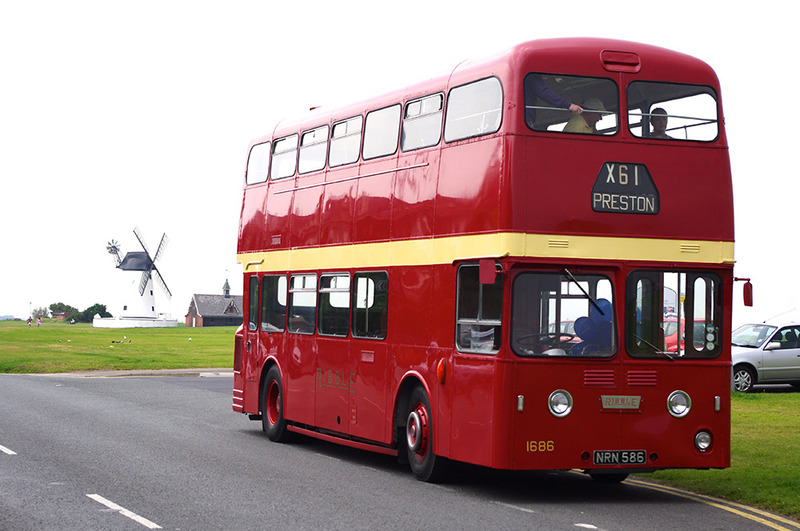 30 were to a lowbridge configuration while the other 70, including 1686, were highbridge. It seems these early models were somewhat unreliable and in 1961 Ribble reverted to PD3s (see our 1775). 1686 spent virtually its entire life at Preston Depot It was withdrawn in 1981 being the last non-OMO fitted Atlantean to be operated- the rest had been withdrawn between 1975-1977. 1686 was painted in NBC Poppy Red in June 1974. On withdrawal by Ribble it had completed about one and a quarter million miles. RVPT acquired it direct from Ribble and it was in good enough condition to be rallied from the outset. It has never been “restored” as such but over the years it has had occasional repairs and repaints. In the mid-90s it became a film star being used as a prop in the filming of “And the beat goes on” which was set in Liverpool in the 1960’s. It was filmed inside the now demolished Edge Lane Works. It has completed many miles during its 30 plus years with RVPT but has also had periods of ‘rest’.